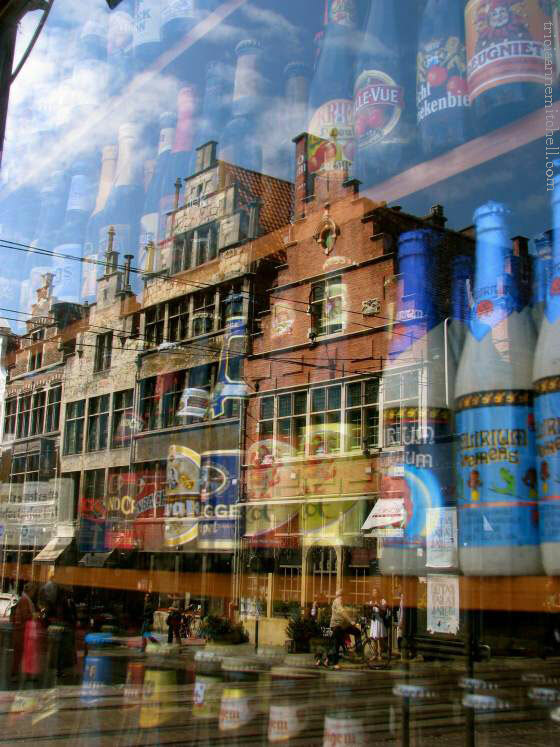 A bustling, Belgian street’s action is captured in the window of a Ghent beer store, featuring a colorful array of bottled beers for sale. Previous postHappy Canada Day Greetings, From Ottawa! Cool shot – love the reflection. You can even see the people on the street talking. Awesome. Very nice shot! Any favorite spots in Ghent you’d recommend? Thank you, I Think About Beer! We only passed a two short days there, but we really enjoyed exploring Gravensteen Castle, ascending Ghent’s Belfry for a super view of the old town, and eating fresh strawberries and dollops of fresh cream. My husband also enjoyed the blonde beer. Are you headed there soon? It’s a charming and largely undiscovered spot – highly recommended! We’ll be going in september. Ghent could definitely make it onto the itinerary. We’ll be staying in Antwerp mostly, but pretty mobile. Should be lovely in autumn! We also enjoyed stop-overs at Waterloo, Brussels, and Bastogne. On prior trips, we saw lovely Bruges – another must, if you can fit it in. Well, I’m doing a bit of Beer tourism. So Brussels, Chimay, Roselaire are on the itinerary. Bruges is also on the list. Plus our hosts are taking us to a Club Bruges soccer game. Long, long ago I fell in love with a man from Ghent. I wonder about him still. There you go Tricia, bringing back very old memories. Virginia, your comment made me smile. It’s funny how an image, a song, a taste can elicit such vivid memories. Hope your Canada Day celebrations were fun! Brilliant – I really like it! Andrew, it was a fun find; thank you. :) So, to which fun destination will your next travels take you? We’re still hoping that we’ll be able to make it to the Greek Islands soon! That is gorgeous and has special appeal for me. I spent six months working and living in Brussels in 1988-9 and still remember Belgium very fondly. Ghent was one of the many places I enjoyed exploring during my weekends. We were really charmed by Ghent’s ambience. Do you have any other Belgian cities you’d recommend? :) Thanks, Madhu. And, aren’t the bottles fantastic? I love their colorful labels! Really like this shot, although after sampling the many bars in Tel Aviv last night beer is the last thing one my mind.